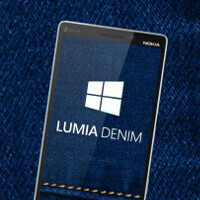 Microsoft's Denim update is already reportedly rolling out for Lumia devices in select regions, namely China, and it seems that Redmond is prepping itself for a more global rollout of the newest firmware update for its Windows Phone 8.1 devices. The Lumia Denim update was announced at the company's event at this year's IFA in September, alongside the mid-range Lumia 730 and Lumia 830. The latter will come with it out of the box, whereas the Lumia 930/Icon and the Lumia 1520 will also get eventually treated to it. The update brings a number of interesting improvements to Cortana, Microsoft's answer to Google Now and Siri, which allow you to easily open the it by saying "Hey, Cortana!" from any screen. Folders on the start screen are also coming. It also dons a number of photography-centric improvements - first of all, you can take photos quicker than before, secondly, the update allows you to record a 4K video clip and still images simultaneously, and last, but not least, you'll be able to extract photos from an already-recorded 4K video. Your phone has to support 4K video-recording, mind you. Well, Microsoft obviously wants to make sure that most users will get the update in a timely fashion, that's why it just posted a brief video tour, which does not only show walks you through the new features of Lumia Denim, but also shows you how to get the update on your supported Lumia device as soon as it's available. Check it out below. Go Microsoft, good luck..seriously,wp is great and it's underestimated. Hope more people will join this platform. Bloody annoying with the voices for promo vids and advertisements these days; if they don't sound downright horny, they're borderline giggling like they've just smoked a big one! WTF happened with talking like a regular person?!? Poor WP, for some reason It cannot lift off... They have to hurry with Windows 10. It's gonna be hard to take off when you have developer's abanding your platform. When was last time you seen a WP commercial-other than the Surface 3 vs Mac air commerical? I haven't seen any. I used the Icon (or 930) for about a week and returned. The only thing great about the phone was the pix....too thick, boxy, always looking at the turning wheel as the phone looks for an app, internet, etc., horribly navigation app, lack of apps (or useful apps), boots up like a windows pc and takes forever. You're trolling dude. If the only thing about the product was what you stated why did Android and iOS leave Skeuomorphism and imitated WP Flat UI, why does Android have immersive mode, three dot menu, flat bright colors, Full locks teen album art, WP lock screen animation etc among other features. Dont be a hater. Microsoft is always playing catch up with windows phone...hope they do something new (good) with windows phone 10. After DENIM update Lumia 930 became slower and less responsive, especially on start screen and scrolling between start and apps list. Good improvement is thar the device does not overheat so fast, when using games or some heavy apps. The camera improvement is awesome..